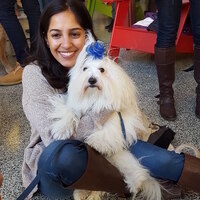 Cookies with Canines, the popular therapy dogs program for exam week, continues. Take a break from your studies to come to Hayden Library and spend some time relaxing with a whole bunch of furry friends from Dog BONES: Therapy Dogs of Massachusetts. Join us outside Hayden Library (Building 14). All are welcome; no registration required.